Can CMO’s increase their social intelligence with software-as-a-service? Marketing experts have climbed every ladder and left no stone unturned to connect to people and interact with them. They have used all the resources possible such as direct mail, surveys and email marketing. Online and mobile applications have replaced these techniques as they deliver better results, save time and are very cost effective. Technological consultants have endeavored to identify new ways of meeting theses needs. HCL Tech, a leading technological consultant has earned a name in innovation with its expertise in engineering and R&D with their research and publications. In a recent study they have tried to identify the role of a CMO is changing along with IT today and how convenient it is to acquire data and connect with people. Business Insider stated in a recent survey that one in almost five consumers are using smartphones and have internet access. This can be very beneficial for CMOs as they can collect data and interact with people on-the-go. 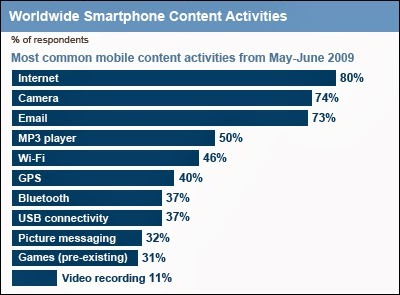 As seen in the illustration above, a smartphone user surfs the internet the most as compared to other devices. Social media savvy mobile users want their internet experience to be personalized. The social software is used to analyze, gather data including comments, navigation and shared content. What’s on The CMO’s Coffee Table? Data is readily available on online social software applications. Externally hosted Software-as-a-service (SAAS) applications such as Tealium Tag Management System and Google Premium Analytics are being used by CMO’s for better interaction with users. A CMO adopts the hosted servers of other groups within the organization such as Customer services and Public Relations, and uses their data in order to interact with people. The new social software gathers information of people participating in social media forums, blogs and also mobile based applications. This information allows organizations to be immediate and precise when reaching a specific user. Traditional methods like direct mail and surveys were much more time consuming and inefficient. If cost-effectiveness is what CMO’s are looking for then, then an internal collaboration with the CIO and the CTO would be the answer. This supported with the unbridled freedom offered by SAAS and cloud services can enhance your platforms, reduce costs and increase reliability. The above article has been written by Experts at HCL Technologies. To know more about the topic, please check an interesting and informative whitepaper on the subject published by HCL Technologies.